MP High Court Grade IV Admit Card 2018 - MPHC Assistant Grade III Result 2015 Released – MPHC Interview Schedule Released - www.mphc.gov.in. 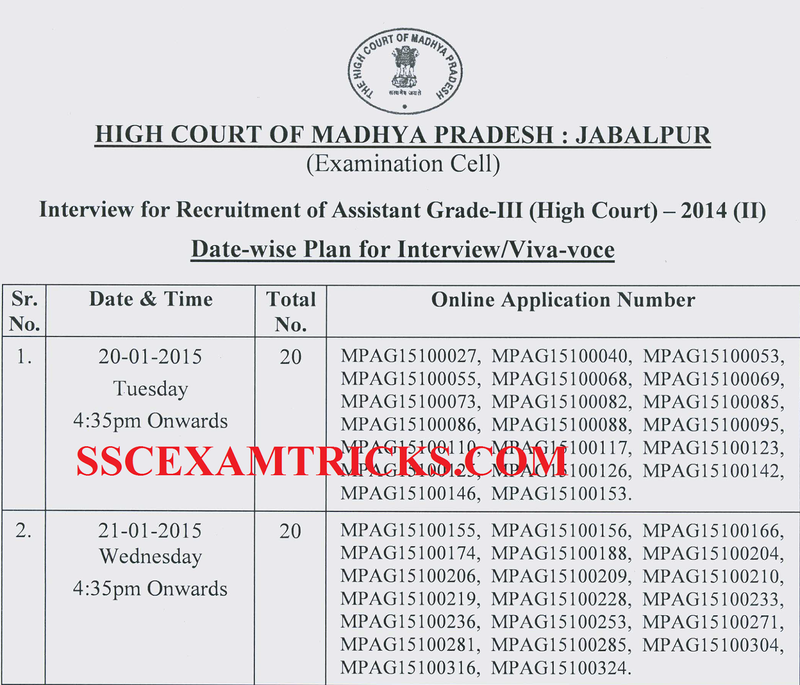 Madhya Pradesh High Court (MPHC) has released result and interview schedule of the short listed candidates for the posts of Assistant Grade III. The interview started from 20th January 2015 in various slots and will be ended on 2nd February 2015. Those candidates who is going to appear in the interview must bring interview letter /application print out with them. All the candidates must bring original document for document verification and at least one set of required documents (mentioned in the end of the post) to the interview. All the short listed candidates will have to reach the venue at least 2 hrs before the scheduled time for document verification. In case any candidate did not attend interview on time. He/She wiil be treated as absent. · Click on the link say save as pdf or print the interview Schedule. · Save and print Interview Schedule Hard Copy for the Interview requirements. Call Letters to the short listed candidate for Interview will be sent by post/courier/email or online on the official website at the correspondence address mentioned in the online application submitted by the candidate. Interview will be conducted in two stages. All the selected candidates must reach the venue of Interview at least 2 hours before the time mentioned on the interview letter of the candidate. Selected candidates are required to bring computer generated online application, result print, original documents (10th, 12th, UC DMC, Cast certificate –If applicable etc.) and one set of self-attested of all the documents to the venue of interview. 10th Certificate is used for Age Proof. Candidate must bring at least one Address proof i.e. PAN Card, Ration Card, Aadhar Card, Voter card or Driving License. Candidates are advised to bring two extra colored recent passClerkrt size photograph (same as pasted on computer generated application form) required for application form or other document requirements. Candidate must bring Caste/PWD/EXS certificate to claim for seat available for reserve category. If the candidate is an employer of any organization then it is mandatory to bring original as well as photocopy of NOC (No Objection Certificate) with them. Interview of short listed candidates will be taken by UPSSC officials to judge the thinking ability and suitability of the candidate for the post of Junior Engineer in Panchayat Raj Department. There may be some technical questions may be asked from the field of civil engineering. The questions asked in interview may be basic to civil engineering. Some Decision making and situational questions may be asked to the candidates. All shortlisted candidates will perform their level best in the interview. The Interview may go for 15-30 minutes. It is advised to the candidates to comminute in English Language or Hindi-English mix language. It is suggested that don’t try to impress the interview committee. Just focus of the ability to answer from depth of their knowledge and experience. Some Expected questions are discussed with candidate for their interview preparation. Final Interview questions and timing may differ from it but these basic questions may help candidate to start their preparation accordingly. · Tell me about yourself. · About Family Background of the candidate. Candidates are advised to bring the following document at the time of getting Appointment Letter/Joining Letter from the authority of UPPSC. · Photo Identify Proof such as Adhar Card, Driving License, Pan Card, Voter Card etc. · Caste Certificate (SC/ST/OBC) issued by the competent authority in the prescribed format as stipulated by Government of India in the case of SC / ST / OBC category candidates.